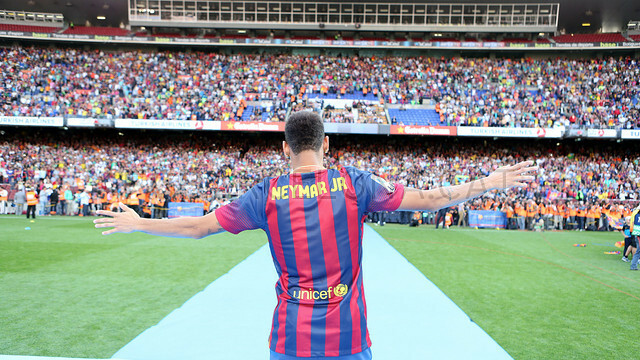 Monday June 3, 2013, is a day Neymar da Silva Santos Junior will never forget. After a long wait, he finally became an FC Barcelona player. Following his medical test, at midday he signed a contract binding him to the Catalan club until 2018. He then stepped outside the office, where the media was waiting to get the first photos of one of the summer’s highest profile signings. He then went indoors to give his first press conference as an FC Barcelona player. Neymar appeared in 41 games in his debut season (26 in the league, 3 in the cup, 10 in the Champions League and 2 in the Spanish Supercup), scoring 15 goals. His first, in the Supercup against Atlético Madrid, won his club’s first and only title of the season. By December 11, in 6-1 win at home to Celtic, he had already scored his first hat-trick for his new club, which were also his first ever goals in the Champions League. But Neymar’s adaptation to European football was also hit by injuries. The first came in the cup against Getafe, and left him side-lined for almost a month.